Been looking for a condenser tumble dryer and so far this is the best price for one. Big drum helps get lots done at once. 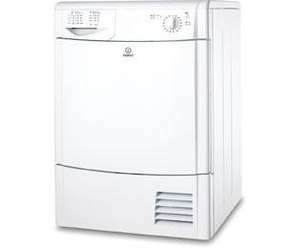 The Indesit Start IDC85 condenser tumble dryer will dry up to 8kg of clothes, that’s up to 40 T-shirts, so it is ideal if you’re running a busy household and have endless school uniforms and PE kits to wash. It’s really simple to use and has everything you’ll need when it comes to drying your clothes. Its C rating for energy is about average for a tumble dryer, so it won’t cost you an arm and leg to run. A full penny cheaper at £183.99 HERE. Although it has to be said this is a pretty poor tumble dryer according to Which? and comes in a a lowly 301st position on the sus-it ratings site HERE. A full penny cheaper at £183.99 HERE. Although it has to be said this is … A full penny cheaper at £183.99 HERE. Although it has to be said this is a pretty poor tumble dryer according to Which? and comes in a a lowly 301st position on the sus-it ratings site HERE. Just been through the process recently and ended up with a Beko (although until I started researching I'd never would have considered them). FWIW: I got the DCU9330W 9Kg condenser from Jade Technology for £236 delivered (although it's now £249). It falls just outside the Which recommended buys (all of which are considerably more expensive) but within my budget. Good luck with the search/decision.